Here are a couple of bee houses built to a similar design. A solid-looking shed with a good high ceiling (the pent roof design must offer good headroom over the hives, with ample space for the stacked supers or tall beekeepers) and reasonable levels of lighting by replacing the front wall with translucent corrugated plastic. Calum assures me that there is usually enough light in these bee houses for a proper frame inspection i.e. to see if there are eggs present. 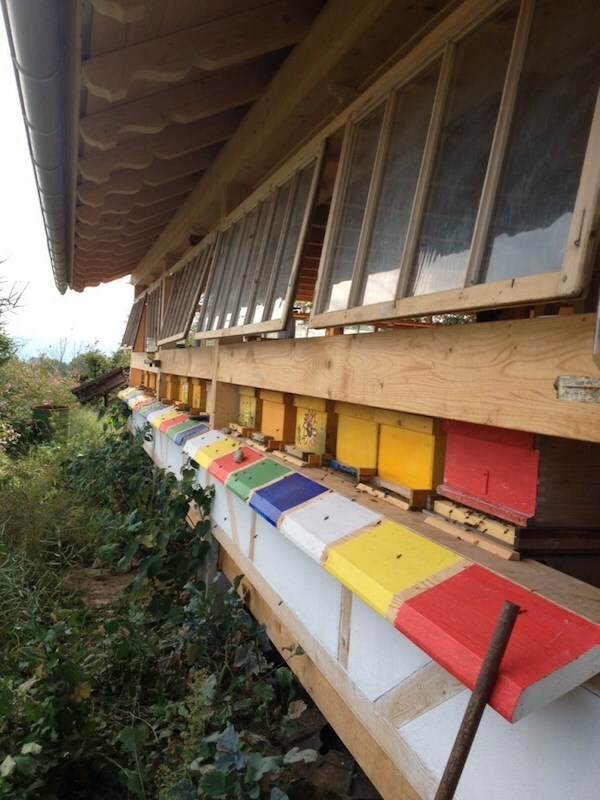 It’s clear how the bees access the hives which – as last week – simply abut the front wall of the bee house. Since there are no opening windows as such I presume there’s a gap under the eaves through which the bees can escape during inspections. The bee houses above are a pretty good size, both in terms of the number of hives they can accommodate and the space to work them and for storage. 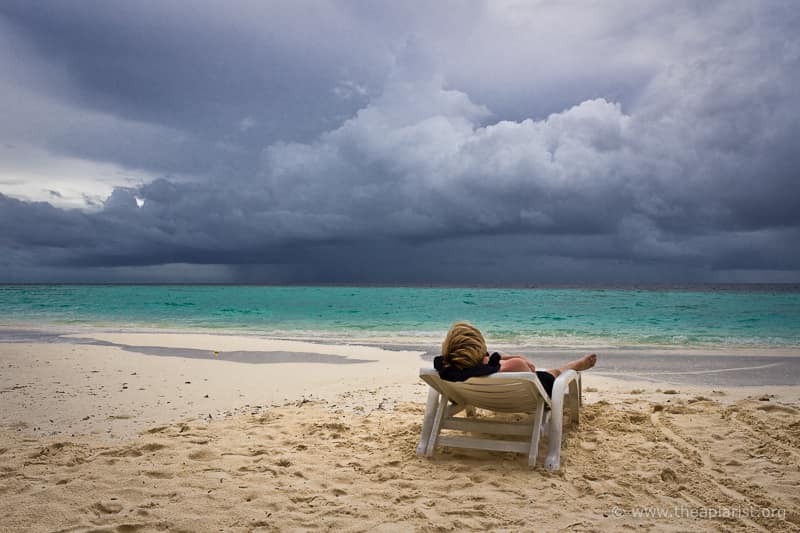 However, with lots of hives inevitably the space becomes more crowded. The following photograph is of the inside of a 30-hive bee house. 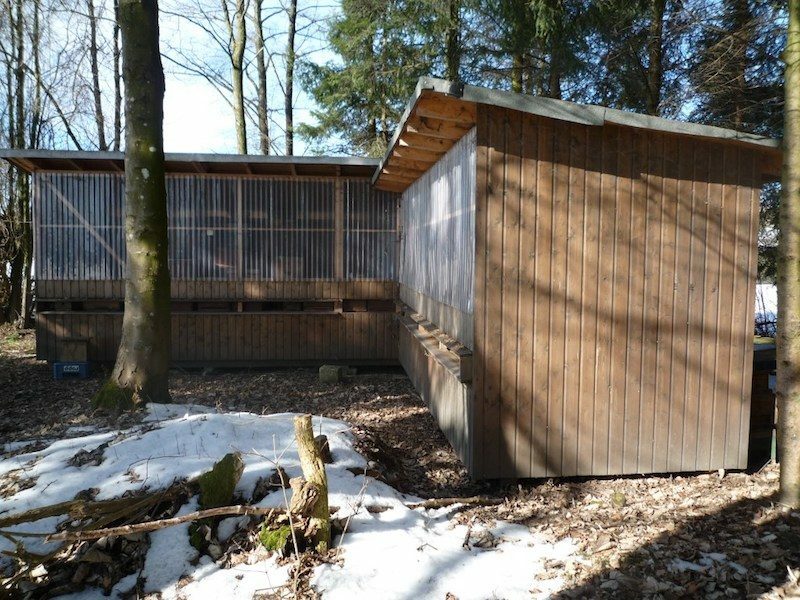 The majority of the hives are of a design known as a Zander hive, with a few other Deutsch Normal (which, as Calum says, “is funny as there is no standard in Germany”). The roof lights provide pretty good illumination (they would be a welcome addition to my own bee shed) which makes it much easier to see the huge amount of additional ‘essentials’ that beekeepers accumulate. And before we move on to the Rolls-Royce† of bee houses here’s another one (above), this time from the outside. I particularly like the sheltered porch area and bench seat, perfect for relaxing on with a cuppa after working up a sweat. My bee shed starts to look rather plain and dowdy when compared with the nicely decorated side panels in the photograph above. All of the bee houses shown so far have provided basic weather protection together with more or less comfort for the beekeeper and space for storage or relaxation. 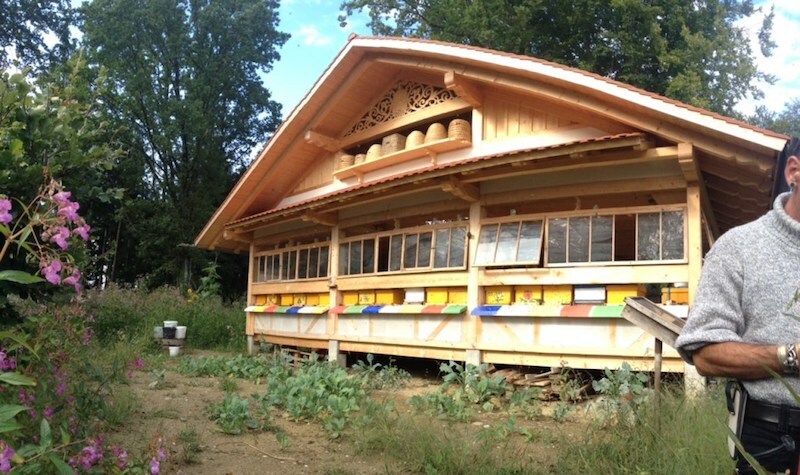 The final bee house is spectacular. It houses 40 colonies and has an extractor (centrifuge) room with an adjacent dining room and living room. 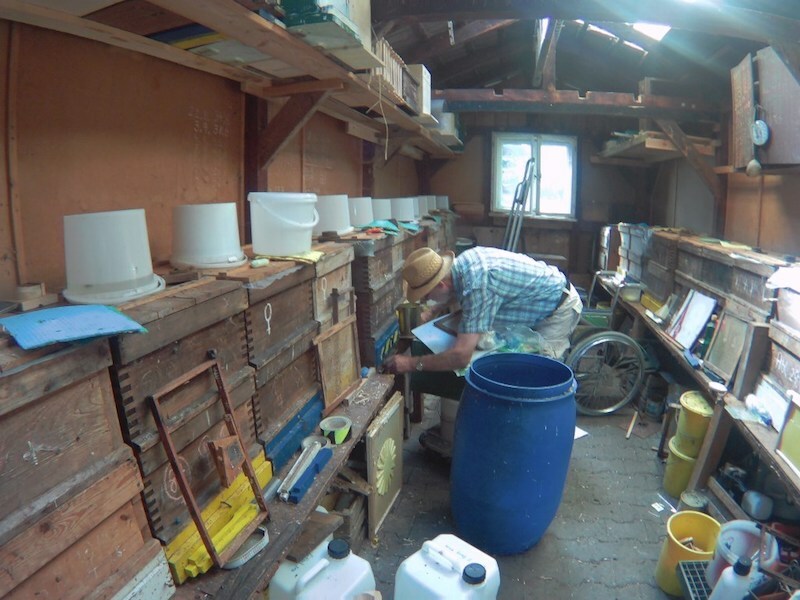 Upstairs there is space for a flat … “planning laws don’t really apply to beekeepers in Germany – as the need to keep them very happy is recognised”, says Calum). 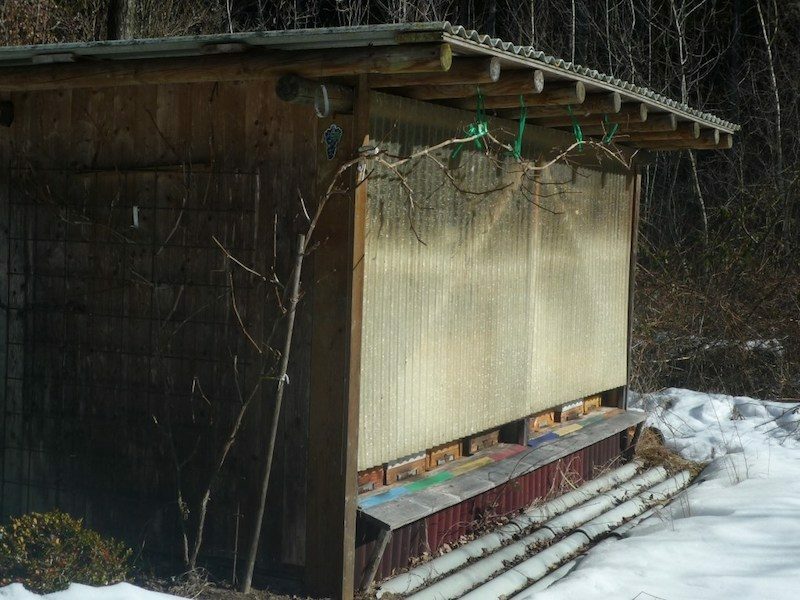 Can you imagine building something like that in the association apiary? Finally, here’s a close-up view of the entrances to this splendid building. The windows are hinged from the top and the area under the eaves is very shaded. It’s not clear whether the bees that fly during inspections escape through the open windows (in which case hinging them at the bottom would almost certainly be more effective as bees always crawl upwards) or if they exit somehow above the windows. The landing boards are painted to try and reduce drifting which might be a major issue with colonies packed so close together. 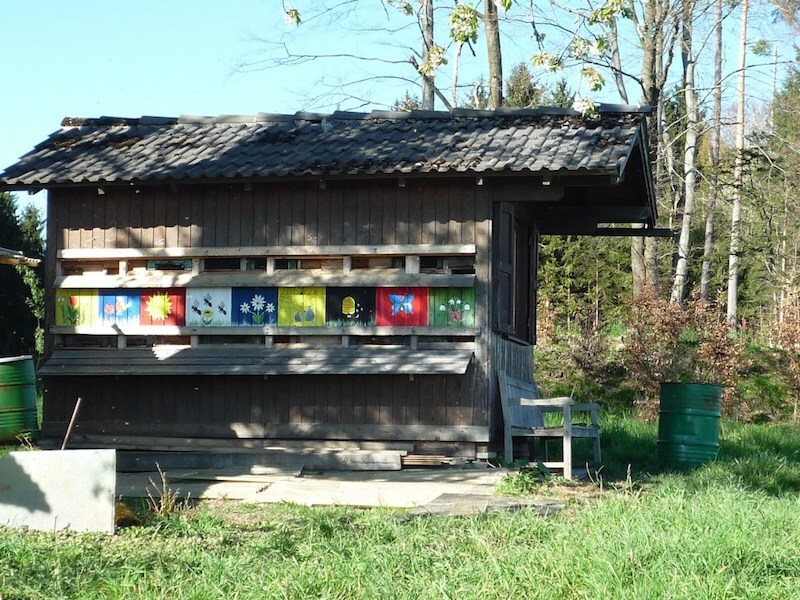 Some of the brood boxes are also decorated with flowers or motifs to help the bees returning from orientation flights find the correct hive. There are a couple of wasp traps fixed to the front of the bee house, one just out of shot and one about 2/3rd the way along in the picture above. That’s almost the last of this brief review of German bee houses from the photos that Calum kindly sent me. I’m saving one back for another posting which will appear sometime in the future. I’ve also received some additional images of bee houses from another part of Germany and northern France which I’ll post in due course. This entry was posted in Bee shed, Beekeeping and tagged bee house, bee shed, BMW, Germany, Mercedes, Rolls-Royce on December 16, 2016 by David.